Home > Consumer Behavior & Trends, Consumer Intentions & Actions Survey, Economy, InsightCenters	> Timeline: What’s behind consumers’ gloomy outlook in the New Year? Timeline: What’s behind consumers’ gloomy outlook in the New Year? In the past three years, Americans have lost confidence that the economy will make a full recovery. This year, 32.3% think the economy can rebound fully, an 8% drop from 35.1% who said so in January 2011 and a whopping 35% drop from the 49.7% who said so back in March 2009. April, 2010 – BP Oil Spill– Although gas prices didn’t skyrocket after this event, pump prices have certainly continued to rise as the U.S. struggles to find cheaper ways to obtain fuel without threatening the environment (sorry Keystone XL pipeline). 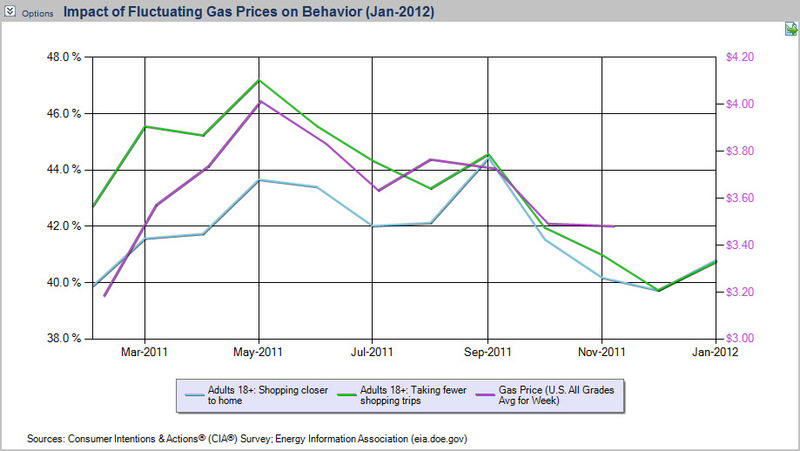 In January 2012, 73.1% say gas prices impact their spending. How are these consumers coping? Taking fewer shopping trips (40.8% say they do this in Jan 12) and shopping closer to home (also 40.8%) appear to correlate directly with the price of gas, implying that consumers have removed “joy ride” from their vocabulary. October, 2009 – Unemployment Above 10% – This number was simply unheard of in a “healthy” economy, and after economists reported that the recession had ended in July, this simply made no sense. Currently, more than 1 in 4 (27.0%) is worried about more layoffs in the next 6 months while 51.0% expect the same. The “same” still means roughly 8.5% unemployment. January 2009 – President Obama Inaugurated – In March 2009, nearly half (49.7%) believed the economy would rebound to its happy pre-recession days. Since then, this number has dropped considerably, as previously mentioned. Those with faith in recovery have increased only slightly since this past summer (2011), and there is a likely cause: another election is approaching! Optimism for rebound peaked shortly after an inaugural address in 2009 – can it do the same in 2013? Only time will tell how Americans will feel after choosing a Commander in Chief – but feel free to keep an eye on them until then! Be sure to check out the Vital Signs InsightCenter™ for the latest consumer views on the economy, including a unique timeline of major events!